From their own website "The Arboretum is home to over 350 thought-provoking memorials, each with a story to be discovered. The memorials are diverse in nature, rich in symbolism and collectively represent a broad population of society from military associations, charitable organisations, emergency services, fraternity groups and individuals. Each year new memorials are added so there's always something new to see." I had no idea it even existed until the day before we went. They started planting it in 1997, the indoor exhibition was only opened last year. "up the lines at night"
The owner died in battle. I also didn't know that "They will not grow old as we grow old..." that is always read out at Remembrance is from a poem called For The Fallen that is actually quite long. 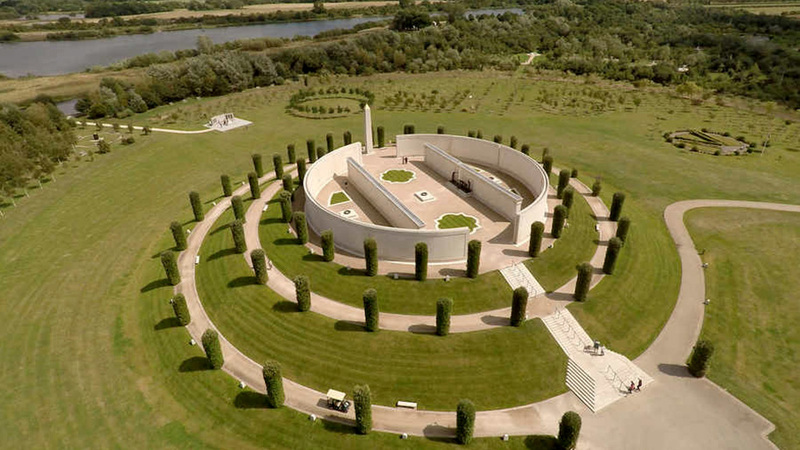 Outside is a huge area, 150 acres with an impressive armed forces memorial at the centre, the type of which I thought only existed in other countries. This was a clever design "Through this space a shaft of sunlight falls at the eleventh hour on the eleventh day of the eleventh month"
The grounds were very flooded when we were there and it was surrounded by water. It really was very flooded and some memorials were completely inaccessible. I looked at this thinking it was something they were just building but it is actually the National Ex-Prisoner of War Association Memorial, after looking for a while I understood. There are a couple of children's playgrounds. On the day we were there they also had an Easter trail and a petting zoo. This is not a sombre walk around a cemetery, it really is a day out made to be thought provoking but enjoyable. And there is lots of wildlife spotting to be done too. The Christmas Day Truce memorial. Because we bought tickets for the indoor exhibition it also included a hand held electronic guide that gave information about each piece. We didn't use it much but sometimes it was really interesting to listen to. The sad area of memorials to babies. There was an indoor area with a lot of interesting information about the prisoners of war in the Far East and outside were sections of the railway they died building. It's not all about the forces, there are many others for the fire personel, police, St Johns, dentists, showmen, vets. The Shot at Dawn Memorial was moving. So many young boys. And the 6 conifers representing the six shooters, possibly known by the convicted, who wore a target around his neck. Only one of the rifles had live ammunition so they did not know who actually fired the lethal shot. And so close by the Hand of Peace: the memorial to the sufferers of mental health illnesses like PTSD. Today we would probably have recognised that many of those convicted of desertion were suffering illness. From Wikipedia: "Britain was one of the last countries to withhold pardons for men executed during World War I. In 1993, John Major emphasised to the House of Commons that pardoning the men would be an insult to those who died honourably on the battlefield and that everyone was tried fairly.However, in August 2006 the then Defence Secretary, Des Browne, reversed this decision. He stated that he did not want "to second guess the decisions made by commanders in the field, who were doing their best to apply the rules and standards of the time", but that "it is better to acknowledge that injustices were clearly done in some cases, even if we cannot say which - and to acknowledge that all these men were victims of war"